Insert DVD, or download Cutting Master 4. Click [Setup Cutting Master 4] button from "Start" screen. Install it in accordance with the wizard from here. The following procedure has been described selectively. Note: when downloaded from our website, double-click on the "Outrun.exe". Click on the [Browse] button when you want to change the destination folder. Click on the [Next] button. Leave the initial values for the check boxes. Click on the [Next] button. Click on the [Install] button. When the following screen is displayed, click on [Yes] button. Click on the [Finish] button. Restart the computer. Now, the installation of Cutting Master 4 is complete. Continuously, perform the user registration on "SAi Cloud Connect". IMPORTANT NOTE FOR HIGH SIERRA USERS: The latest security and privacy setting on this OS may prevent the CM4 installer from even opening. Click Open Anyway on your warning window. Insert DVD, or download Cutting Master 4. Double click on [Cutting Master 4_signed.pkg] file. Install it in accordance with the wizard from here. 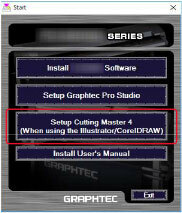 Note: when downloaded from our website, double-click on Cutting Master 4_signed.pkg. The following screen may be displayed. Click on the [OK] button. Click on the [Continue] button. Enter the "User Name" with the administrative right and "Password" and then click on the [Install Software] button. Enter the "User Name" with the administrative right and "Password" and then click on the [OK] button. When the following screen is displayed, click [Yes] button.